Summary: From the folks that brought us the big sound in a small package of Markbass bass amps, comes the DV Mark guitar amp line.Pros: Unbelievably rich tone with lots of clean headroom for a low-wattage amp. But you can dirty it up just fine by adding more pre-amp gain. Super-responsive dynamics as well, and the dirty tone cleans up nicely with volume knob or lightening up pick attack. Tone Bone Score: 5.0 ~ I was already impressed with Markbass amps for bass (the bassist in my church band swears by his Little Mark II), and with the recent introduction of a guitar amp line, I’m VERY impressed with what DV Mark is offering! I met my good buddy Jeff Aragaki of Aracom Amps at our local Guitar Center today, and the first place we went to was their high-end guitar room where they always have nice guitars. Being Les Paul guys, we of course were ogling the historic re-issues. 🙂 But as we turned to go out of the room, we noticed a display of all-black amps with cool, metal mesh housings, and a brand we’d never seen before: DV Mark. Jeff exclaimed he’d never heard of this brand. I agreed that I hadn’t heard of it either, but the “Mark” in the name made me think that it was associated with the Italian manufacturer who makes Markbass bass amps. The amp has a real modern look to it with its metal housing, and chrome bumpers to protect the knobs, but has an almost old-school feel with the cream-colored chicken head knobs. The logo lettering is “Mesa-ish,” and out of the corner of my eye, as I walked in the room, I actually mistaked the amps for Mesa amps, so I dismissed them. It wasn’t until I looked at the amps directly did I see that it was a different logo. The amp does have a strap, but it’s unlike other straps I’ve seen. As opposed to being attached to the top, the strap is instead attached to the sides of the amp and run over the top (you can see this if you click on the picture above to enlarge it). This thing is light, weighing in at just over 10 lbs. The accompanying C112 1 X 12 cabinet weighs about 15 lbs., so lugging the head/cab around to gigs or rehearsals is not a problem. This light weight points back to the Markbass bass amps which are known for small size and weight but a big sound; and does this amp have a big sound. So after making a visual inspection of the amp, curious about how it sounded, I went out to the main showroom to fetch a Les Paul from the rack – it was a nice Standard Traditional with the coil-tapping volume knobs (by the way, I want one of these, though I’m leaning towards the Standard Traditional Pro). I plugged in the guitar, and Jeff started twiddling knobs while I played. We first started with the Master dimed and added very little pre-amp, to test out the cleans. As expected, the completely cranked Master volume produced a bit of hum, though turning a bit, I was able to reduce it significantly. So that wasn’t a negative at all. But despite that, the clean tone was fantastic. We were both impressed by the amount of clean headroom that amp has! The cleans aren’t as deep as Fender cleans by any stretch, but they’re still thick, with perhaps a bit of midrange hump. I scooped the EQ and was rewarded with a beautiful, deep clean that I could play with for hours. One thing that immediately stuck out with the amp was how loud it was. That alone was impressive because right away, I knew this amp could cut through a mix quite nicely. The 1 X 12 cabinet houses a custom B&C neodymium speaker rated at 150 Watts. I imagine that the speaker is voiced with a fairly robust bottom end, which is probably why the amp sounds so huge. But the cabinet also seems to project and dissipate sound really well because even at lower volumes, the single speaker really filled the space. As far as dirty tones were concerned, the Galileo 15, powered by EL84 tubes reeks with Marshall-esque tone, but with a slightly more robust bottom end. As such, the Les Paul growled quite nicely. There did seem to be an ever-so-slight filtering of the highs, but I believe that gives the amp’s tone its unique character. It’s voiced similarly to a classic Marshall 18 Watt Plexi, but its slightly darker tone gives it a much smoother output. Needless to say, I dug it. The Tone Bones score says it all. This is a great little amp, and one I wouldn’t mind having. 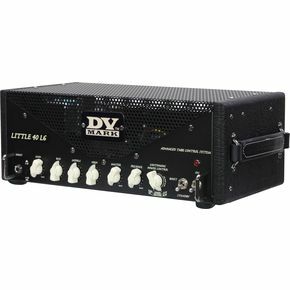 However, I will say that it’s not the DV Mark amp that I would buy myself. I rated the Galileo purely on its merit, but I already have amps at 18 and 22 Watts that cover this territory. So if I were to get a DV Mark, the one I’m really hot on is the Little 40, which I’ll discuss in an upcoming entry. But real quick, what has me going about the Little 40 are a couple of unique features that I think are game changers. First of all, with the Little 40, you’ll never need to bias tubes again because the amp sports special circuitry that will not only bias the power tubes to their optimal operating values, it’ll also match the tubes if they’re within 20% of each other. That is a HUGE feature! Furthermore, the amp sports what DV Mark calls a “Continuous Power Control” which allows you to control the ouput of the power tubes. Similar to power scaling, I presume, it allows you to go down to low wattages, not just for volume, but to overdrive the power tubes earlier. Wide open, the amp has TONS of clean headroom, but dial the CPC back, and you can have nice crunch at reasonable volumes.